"For I was hungry and you gave me food..."
The St. Philip's Food Pantry helps feed our neighbors. The Food Bank is in great need of new volunteers None of the volunteer duties are hard. Click here to read about the duties. We welcome you with open arms! Please contact Beth Adeson or Jessica Stewart ASAP. The feeling you get after helping those in need is next to none! Donations are accepted daily in the collection box located inside the church entryway. 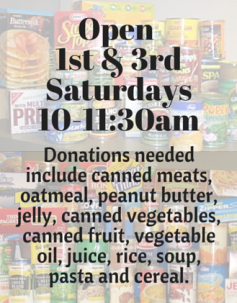 Monetary donations are also always welcome. Please mail or bring checks to the office, payable to St. Philip Catholic Church with "Food Pantry" noted in the memo field. Volunteers are always needed, and we are in particular need of Spanish-speaking volunteers to work during distribution hours (first and third Saturdays from 10-11:30am). We need food bin emptiers, shelf stockers, bag preparers and food distributors. Calling all teenagers – If you’re in need of community service hours, we’d love to have your help. For more information or to volunteer, please contact Beth Adeson or Jessica Stewart, or call the Rectory at (703) 573-3808. We also need brown paper bags.